Learning as We Go....: Welcome Tatum!!! 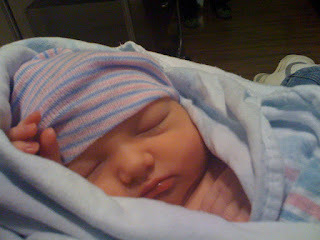 I would like to introduce my baby sister’s new baby: TATUM ELIZABETH. She was born on February 20th, weighing in at 8 pounds, 3 ounces and 21” long. Both Mommy and Daddy are doing well, though a bit sleep deprived! Tatum is a wonderful baby who LOVES to eat!!! Since Holli is her only food source, that means a lot of sleepless nights, but Holli describes it as lots of opportunities for special mother-daughter moments. And Tatum LOVES her mommy! Mommy talks and talks to her, telling her how much she loves her and how “precious” and “gorgeous” she is. Of course, she thinks Daddy is wonderful too, especially since she has him wrapped REAL tight around her little finger! All she has to do is quiver her little bottom lip slightly, and he has her in his arms befo re she even has to fully wake up. It’s a funny feeling watching my baby sister (younger than me by 4 ½ years) be a mommy. And, Holli’s an AMAZING mother! I found myself just watching her as she provided for and cared for Tatum, and asking all kinds of questions. It’s nice when your sisters have babies, you don’t have to feel like your questions are too personal! (Especially, with my sisters, we’re very close!) Holli is so knowledgeable and has already taught me so much! Thank you, Holli! Happy 2nd Birthday Makenzie Renee! Happy 1st Birthday Xavien O'neal!! !